It’s the time of year when our top brands send us their very best Spring/Summer menswear. We’ve had a glut of superb summer garments from Fred Perry, Farah and Lyle & Scott, some of which we’ve profiled here. 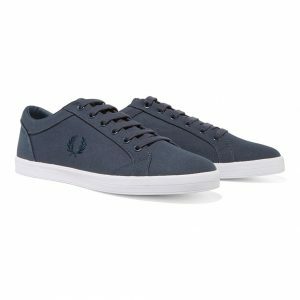 There’s an amazing new sneaker by John White, a classic canvas shoe from Fred Perry, and a whole range of shorts by Lyle & Scott. Use the offer code SPRING18 to claim 10% off everything in the blog. No matter what the style, Fred Perry always pull off a brilliant heritage design. These canvas shoes, available in our shop in Navy and White, are the perfect option for casual wear. Your foot sits on a memory foam insole, ensuring years of comfortable wear. There’s even a padded collar, useful for wearing with “invisible socks”, and finished off with a non-marking sole. You can wear this shoe with pretty much everything: chinos, jeans, shorts, you name it. John White are British shoemaking legends. Based in the British footwear Mecca of Northampton since 1919, this brand have packed all their expertise and quality into this new SS18 season sneaker, revamped from last year’s popular version. 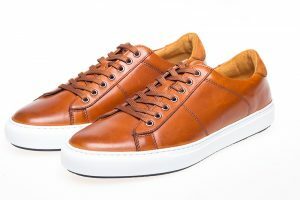 It’s as well-made as you’d expect from heritage shoemakers, with super-soft Nappa leather, a high-grade rubber sole, comfort tongue and ankle quarter, and a soft padded collar on the heel. There’s two lovely updated colours this year: Tan (pictured) and Green. Lyle and Scott have re-released two stunning shorts for Spring Summer 2018. The first is a classic tailored fit chino short, popular with returning customers year after year. 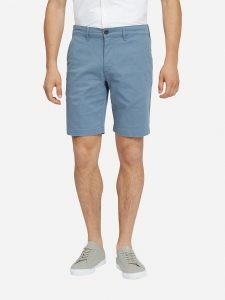 It’s made from a quality cotton with a hint of stretch for comfort and flexibility, and there’s two button pockets at the rear for added security. Choose from three classy colours: Mist Blue (pictured), Stone, and Navy. With waist sizes ranging from 30 to 38, we’re confident that we’ll have the perfect fit for you. 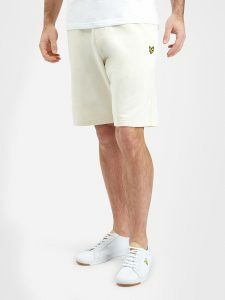 This delightfully soft cotton jersey sweat short is one of our customer’s favourites from Lyle & Scott. There’s three new colours for SS18, the standout of which is this stunning Seashell White. The loopback cotton interior is designed to keep you cool in the Spring/Summer months, and the elasticated ribbed waistband with drawstring means you can adjust for the perfect fit. Great for wearing both indoors and outdoors, this new sweat short also comes in Mist Blue and Mid Grey Marl. 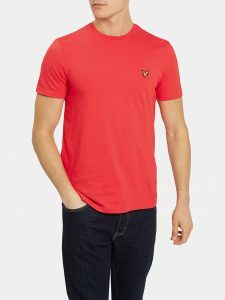 Simplicity has always been Lyle & Scott’s hallmark, and this classic plain T Shirt is the epitome of that ethos. The garment has long been a staple of our collection, in an enormous range of colours, new and old. There’s quite a few Spring Summer 2018 colour additions, such as this unforgettable Poppy version. Ideal for wearing under a shirt or sweatshirt, or on its own when the temperatures soar. Still only £25 after all these years. Browse the full range here. A final reminder — use the offer code SPRING18 for 10% off all new menswear at Apache! New Lyle and Scott SS17 Arrivals!